I’ve been playing with the IBM RAVE engine a bit today. I tried applying it to the data at xbrl.mybluemix.net. 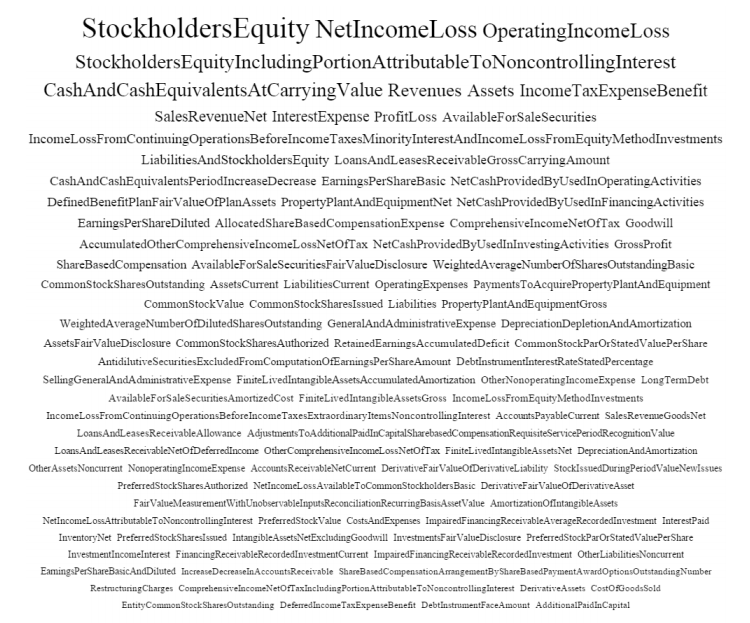 Here’s a text cloud showing the 100 most reported financial concepts. What does this mean? Nearly all filers are likely to report certain concepts like Assets. Furthermore, a concept that is more highly dimensionalized has more data points. For example, here’s General Motor’s breakout of StockholdersEquityIncludingPortionAttributableToNoncontrollingInterest. Very highly dimensionalized. Unfortunately the query to generate this text cloud takes about 40 seconds to run, so it’s not feasible to have it live. First we’ll need a stream that can extract the bookmark value and store it in a pass-by-reference variable. #Buffer an incoming stream until a "bookmark" field is found and store the value. #If we haven't found what we're looking for, keep appending the incoming chunk to our buffer. #have to store very much in our buffer. Next we’ll need a stream that takes incoming objects and outputs them as a JSON array. This presumes we’re sending the results somewhere, like a response stream, a file, or the console. Finally we’ll use a recursive function to execute each API call in sequence, using the bookmark from the previous call. The JSONStream package is very useful here. query = "query goes heere"
If we want distinct results, we’re going to need a new stream that accumulates results before outputting at the very end. Faceting won’t help here. It can give us a distinct list of identifiers and a distinct list of names, but not id/name pairs. Oops. This is serious enough that this method is probably unusable in most cases. I present it here in case someone does find it both usable and useful. A naive solution would be to increase the limit, say to 100, then simply process the list on the client or server, keeping only distinct results, before populating the combo-box. This would work for our simple example, but suppose IBM reported its Assets 100 times, or 1000 times? Cloudant imposes a maximum limit of 200 results. If IBM had reported “Assets” 1000 times (note that this is a bit of a contrived example) we’d be out of luck. That final associative array is what we’re after, a list of permutations of the name field containing “Assets” and how many times each permutation appears. Caveat: There is no “limit=x” option when working with the counts facet. So if the query were to be something like all documents where the concept contains “e” the query could take a very long time and return an extremely long list of counts. This is not an official “best practice” or anything, just a habit I fell into while working with Cloudant and large data sets. View indexes are rebuilt when a design document is updated. An update to any one of the views causes all the views in the document to be rebuilt. That second sentence is the important bit. xbrl.mybluemix.net as of the time of this post has just under 70 million documents in its main database. Building a simple secondary index against this data usually takes about 72 hours. If you have an application depending on such a view it will either show very incomplete data, or no data at all, during this time. There are other articles out there that say that each design document conceptually represents an “application” and each view a part of that application. That sounds nice, but if you’ve got hundreds of gigabytes or terabytes of data it means that if you want to change one part of your application, or even just add to it, you’re going to bring the whole thing down for days. Even if it’s just dev and not prod, that’s really annoying. So whether or not it’s an official “best practice” or not, I’ve fallen into the habit of having as few views per design document as possible, usually one or two. It may not be as pretty, but if I want to change one part of an application without taking down all the other parts it’s really nice. When creating a search index over a Cloudant database a number of analyzers are available for parsing/tokenizing full text data. When building xbrl.mybluemix.net the field I wanted to search on was camel case strings like SalesRevenueNet. It’s important to note that the first filing uses US-GAAP 2012, while the latter uses US-GAAP 2013. Is this the reason? Maybe DeferredTaxAssetsNet is calculated differently in the two systems? I’m not enough of an accountant to know. On the other hand maybe Tesla made some kind of mistake in reporting the value for the previous year when they were filing their 2013 10-K. On the other other hand maybe this data isn’t meant to be time contiguous and it doesn’t make sense to display it this way? Anyone who knows please chime in.